Technology is playing a vital role in our daily life. Advancement in wireless communication is the most actively growing technologies of our time. It has reduced the complexities made the human life easier. 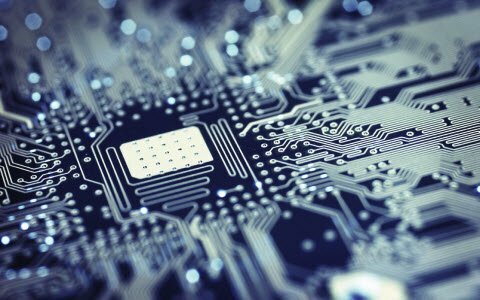 This technology has greatly influenced the telephonic system and internet technology. 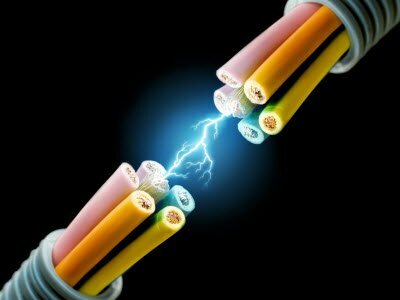 The transfer of information the points without any physical connections like cables is termed as wireless communication. It is a type of a data communication system. In broad words, wireless communication uses signals for data transmission. Wireless communication works through electromagnetic signals. These are broadcasted into the atmosphere through a device. The transmitting device can be a sender or an intermediate device which propagates wireless signals. The communication between the two devices occurs when the transmitter and the receiver capture the signal forming a wireless bridge between the devices. Wireless communications are of various types depending on the technology, ecosystem and delivery method. Here are the different communication systems. Though these communication technologies have unique architecture, they work on the transmission and receiving of the data wirelessly. The radio frequency signals can travel longer distances than the infrared signals. RF signals do not interfere with other RF signals over one frequency band. HT12E is an encoder IC Which will convert the 4 bit parallel data given to pins D0 to D3 to serial data and at the output pin Dout. This output serial data are given to the RF transmitter. Address inputs A0 to A7 can be used to provide data security and can be connected to GND (i.e., logic ZERO) or left open (i.e., logic ONE). The status of these address pins should match the address pins of the receiver for transmission of data. The data will be transmitted when the Transmit Enable pin (TE) is LOW. The resistor of 750KΩ will provide the external resistance for the operation of the internal oscillator in HT12E. 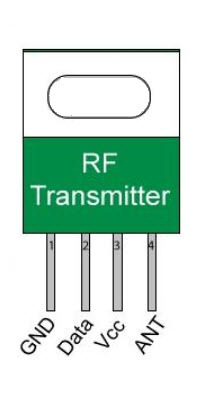 An RF receiver receives the transmitted data from the RF transmitter. 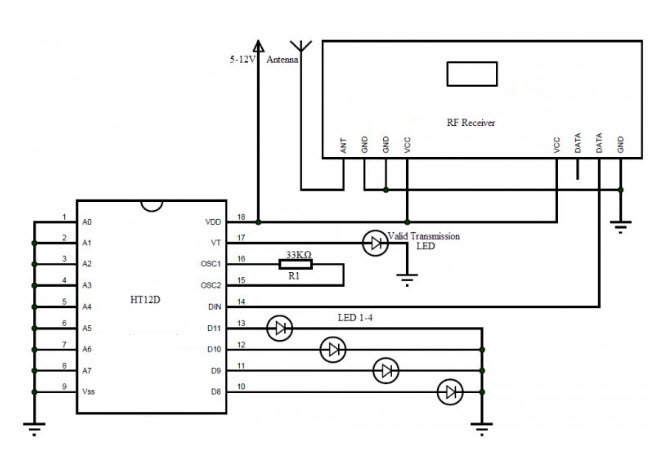 HT12D decoder will convert the received serial data to 4 bit parallel data D0 to D3. The status of the address pins A0 to A7 should match with the status of the address pins at HT12E for transmission of the data. 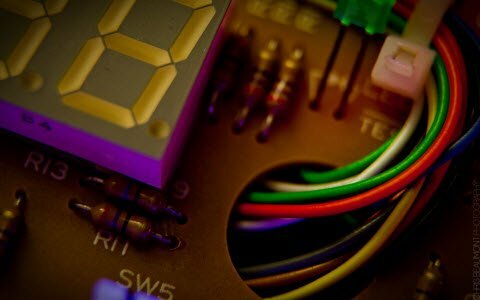 The LEDs connected to the circuit glows when valid data transmits from the transmitter to the receiver. A 33kΩ resistor will provide the necessary for the working of the internal oscillator of HT12D. The wireless PC communication system uses 2.4GHz trans-receiver to establish communication between the two computers. This system is used in offices for communication between the employees and the manager. A wireless PC communication system uses a pair of 2.4GHz transceiver module which is powered by 5 volts DC and an alarm circuit. This system is used for bi-directional real-time chat communication from one PC to another using the hyper terminal. A pair of transceiver modules is connected to the PCs using a DB9 connector and a serial data cord using RS232 protocol is used for communication between the module and the PC. 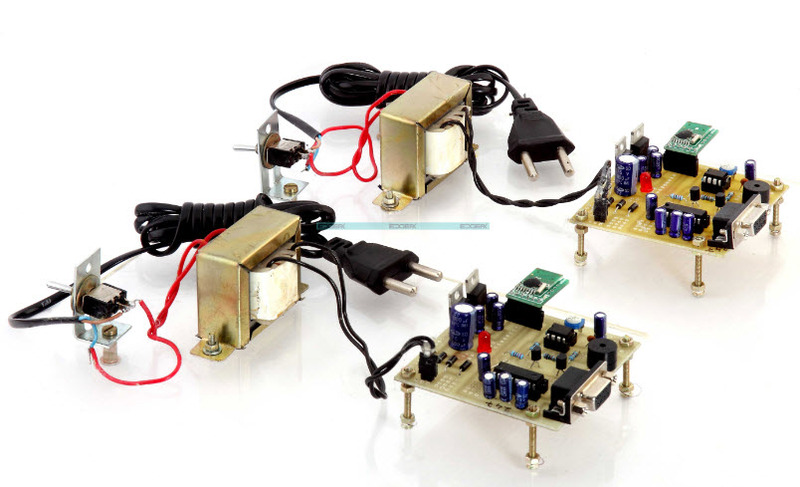 An onboard AC to DC power supply is used at both the ends to power the units. While one of the users attempts to initiate the chat, an intimation is created using a buzzer sound upon the receipt of the message. Thereafter, the other user can start communication over the chat mode from the PC. Wireless PC communication system project works only on operating systems having hyper terminal and the computer must have an RS232 serial port. 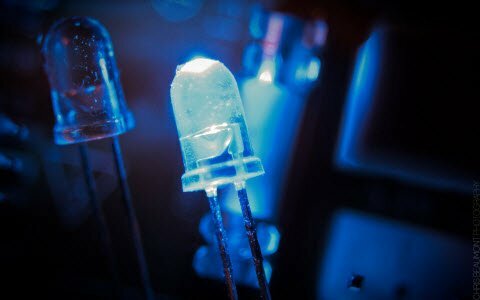 The circuit uses standard power supply comprising of a step-down transformer from 230Vto 12V and 4 diodes forming a bridge rectifier that delivers pulsating DC which is then filtered by an electrolytic capacitor of about 470µF to 1000µF. The filtered DC being unregulated, IC LM7805 and LM1117 are used to get 5V DC constant at its pin no 3 irrespective of input DC varying from 7V to 15V. A 555 timer is used to provide a time delay in various applications. The timer circuit consists of a 555 timer IC, resistor and capacitor combination and a transistor. The timer circuit is connected to the pin 14 of microcontroller through a slide switch. The MAX 232 is an integrated circuit used as a voltage converter. This IC is used in communication systems where the voltage level conversion is required to make TTL devices to be compatible with RS 232 standards of PC serial ports and vice versa. The controller operates at TTL logic level (0-5v) while the serial communication PC works at RS232 standards (+25v to -25v). This makes it difficult to establish a direct link for communication. MAX 232 acts as an intermediate link between them. 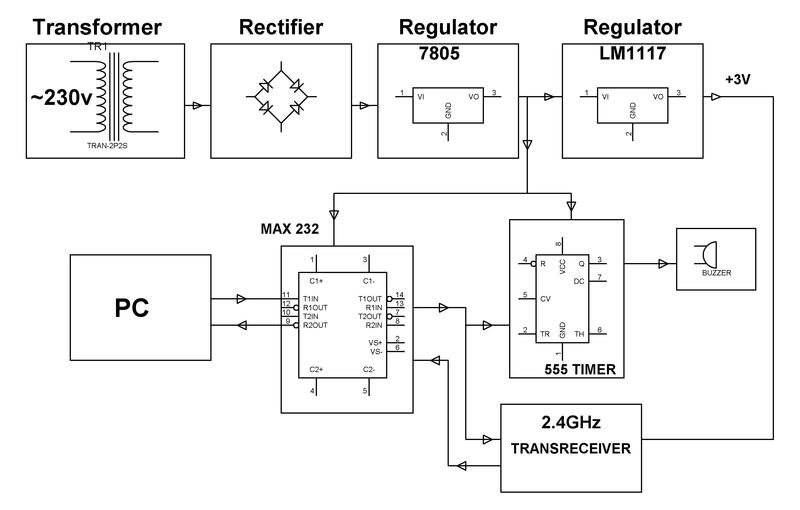 MAX 232 is a dual transmitter/receiver that is typically used to convert the RX, TX, CTS and RTS signals. This is an RF-based 2.4GHz frequency transceiver designed for low power wireless applications. 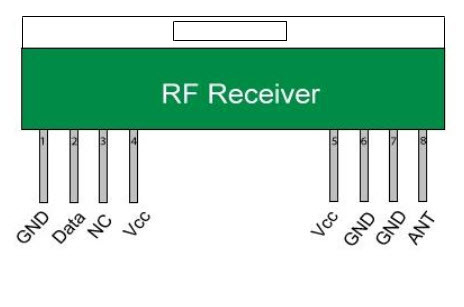 The RF transceiver is integrated with a highly configurable baseband modem. This is a low-cost device. 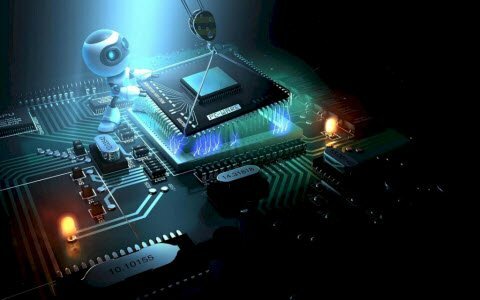 This concept is future can be further enhanced to link a number of systems forming a network of computers so that a number of employees can communicate with each other. 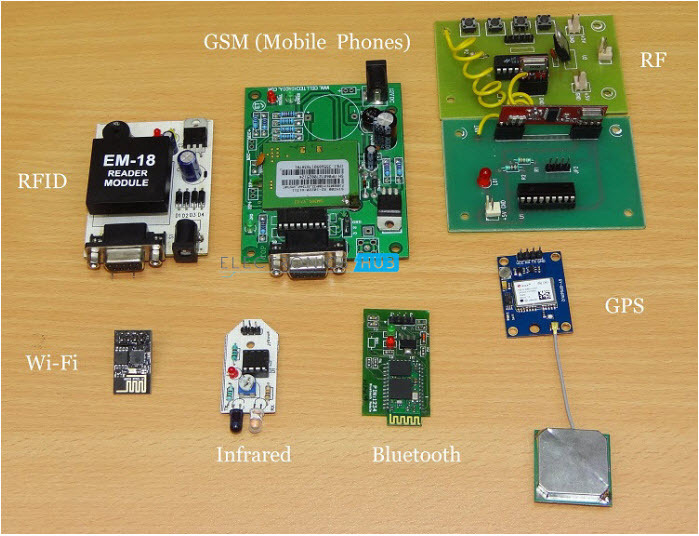 Thus, this is all about Wireless PC communication system and its applications. We hope that you have got a better understanding of this concept. 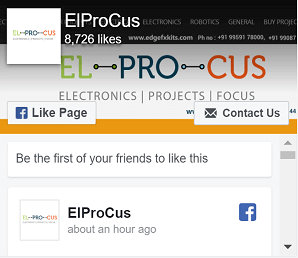 Furthermore, any queries regarding this topic or wireless communication projects, please give your valuable suggestions by commenting in the comment section below. Here is a question for you, what is the main function of RS232?